I joined a cookbook book club through Meetup.com. We picked a cookbook (Flour, by Joanne Chang) and everyone picked a recipe to make. It’s a great idea and I had a great time meeting people and sampling recipes. Most of what was there was sweet (plum clafouti, lemon poppy seed bread, oat and cherry muffins) so I went with a savory recipe, and really, I will take any excuse to make a biscuit. This recipe is easy to make and I liked the parsley butter that goes on top. The sage makes it a perfect Thanksgiving recipe. In a stand mixer fitted with the paddle attachment, mix together the flour, baking powder, baking soda, and salt on low speed for 10 to 15 seconds, or until combined. Scatter the cold butter pieces over the top and mix on medium-low speed for about 1 minute, or until the butter is broken down and the mixture resembles coarse crumbs. In a small bowl, whisk together the buttermilk, cream, egg, and sage until well combined. With the stand mixer on low speed, pour the buttermilk mixture into the flour mixture. Unscrew the bowl from the stand mixer. Using your hands, gather the dough together and turn it over in the bowl so that it picks up the loose dry ingredients. Turn the dough a few more times, until all of the dry ingredients are mixed in. Dump the dough onto a lightly floured work surface and pat it into a 1-inch-thick round. Using a 3-inch round biscuit or cookie cutter, cut out biscuits and place them on a baking sheet. Remove, place the pan on a wire rack, and let cool. In a small bowl, mix together the melted butter and parsley. 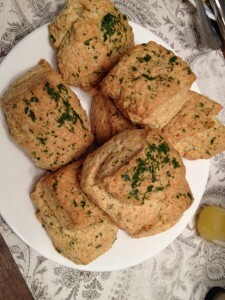 Brush the tops of the biscuits with the butter while they are still warm.